A ragtag team of adventurers steps softly through the dark dungeon, swords and wooden pistols drawn. The Falconer and Seraph lead, with a few Crusaders behind. From a darker recess of the dungeon, a Thrall emerges to confront them. This could be just another moment in Darkest Dungeon, an increasingly popular fantasy-adventure video game. But these characters are among many modifications (or “mods”), created independently by Marvin Seo, a 21-year old art student. And he created them completely on a Microsoft Surface Pro, with Windows 10 and the Surface pen. 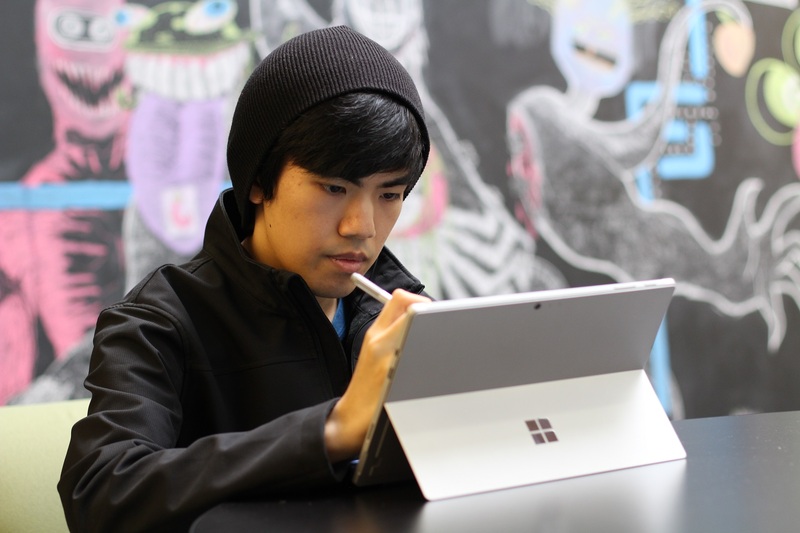 Marvin has drawn game characters since he was in grade school, but Surface Pro lets him draw virtually anywhere, anytime. Which is how he likes it. “When it comes to what I want to spend my time on, it’s making drawings like this,” Marvin said. Marvin uses the new Surface Pro and Surface pen for all his art work, not just when designing video game mods and characters. Surface Pro has been his exclusive medium at the The Art Institute of Seattle, where he’s excelled. 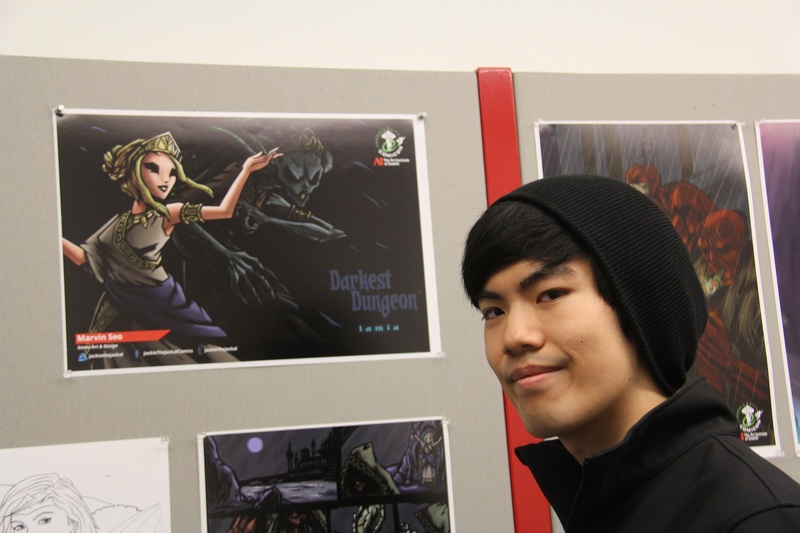 His work also earned him an opportunity to do freelance design for a Canadian video game developer, while still in school. “Marvin would often be on campus late, just drawing,” said Sam King, Director of Campus Relations for The Art Institute of Seattle. “Whenever I’d see him, he’d be in a lab, or in a common area, with his headphones on, with his nose down to his Surface tablet, working on his skills. Even though on campus we have a lot of big screens students can use, he prefers that portability of working on the Surface. Then he can unplug, get on the bus, go home, and have the same working file in the same state that he left it." Marvin does draw for five or more hours a day, many of which can occur on the bus, in the school cafeteria, at home, or wherever the muse strikes. 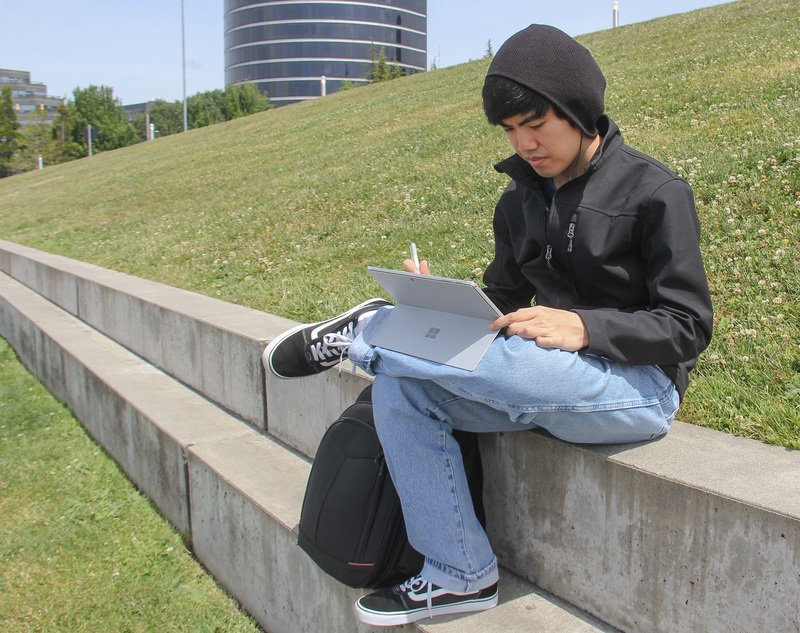 For him, Surface Pro’s mobility is critical. He’ll stand it up on a table, or typically he sits, legs crossed, and props the Surface with its kickstand over his crossed leg to draw. His drawing style is active, deft and controlled. Pen angles and strokes add color, texture or shade. Quick finger taps or gestures on the Surface screen zoom or rotate the drawing. He also makes extensive use of the button on the pen’s side, which brings up shortcut menus just like using right-click on a mouse. With his other hand, key combinations on the keyboard control the effects his pen produces in his drawing program of choice, or open another window on Surface Pro to let him see reference images, sketches or research material. Digital artists, including most Game Art and Design program students at Marvin's school, commonly use pens on digital drawing pads connected to large desktop monitor screens. With those, the pen work happens on the pad on the desk, but the artist watches the monitor. They not only lack Surface Pro’s portability, they also don’t reproduce as well the pencil-on-paper format Marvin has used since he started drawing. In candor, Marvin said he didn’t set out to buy a Surface Pro. He’d had cheap drawing tablets for a few years, but when he decided to go to college for art, his mother shopped with him for a better one. “We looked through all of the tablets, and all of them were nice, but the best one, for price and for function for me, was the Surface Pro 3,” he said. “My parents said the price was a little high, but said if I worked hard, it would be worth it.” After a few years of heavy use, he upgraded to the new Surface Pro he has now. Windows Community recently invited Marvin to meet and connect with engineers from the Windows AI & Ink team and from the Surface team. After watching for a while how Marvin uses Surface Pro and Surface Pen, the engineering team shared other Windows inking techniques and functions that he might find useful. For his part, Marvin had not explored much of the inking capabilities available beyond his main drawing program. He was intrigued by using the pen in OneNote, as a way to collect sketches and ideas, and Sketchpad, an app that comes in the Windows Ink Workspace in pen-enabled devices. He was also excited to hear about coming improvements to the Surface Pen, including a way to find it if it’s lost. It only served to affirm the Surface Pro as his medium of choice. “I’m glad to use Surface as the way to improve myself as an artist,” he said. The engineers, meanwhile, took away observations they intend to use in improving their products. Avani Reddy, a program manager in the AI & Ink team, was surprised to see Marvin draw with Surface Pro steeply propped up with its kickstand, rather than laying it flatter, or on a tabletop. She noted how he uses the pen without resting his hand on the glass top, like a painter uses a brush. And she saw how his use of the pen relied heavily on the keyboard, for hotkeys or browsing researched material. Surface Director of Program Management Tim Golik said the Surface team has worked hard on its optically bonded display, which gives the effect of drawing without the sense of a layer of glass under the pen. He said years of work have also gone into developing a glass-pen friction that mimics that of pencil on paper. Marvin’s technique also puts a focus on the Surface Pro kickstand. Golik said its hinges are extensively engineered for a variety of demands, which works out for Marvin’s style of use. See more of Marvin’s art at https://www.artstation.com/jackiethejackal and at http://marvinbensonseo.wixsite.com/marvin-seo-portfolio.